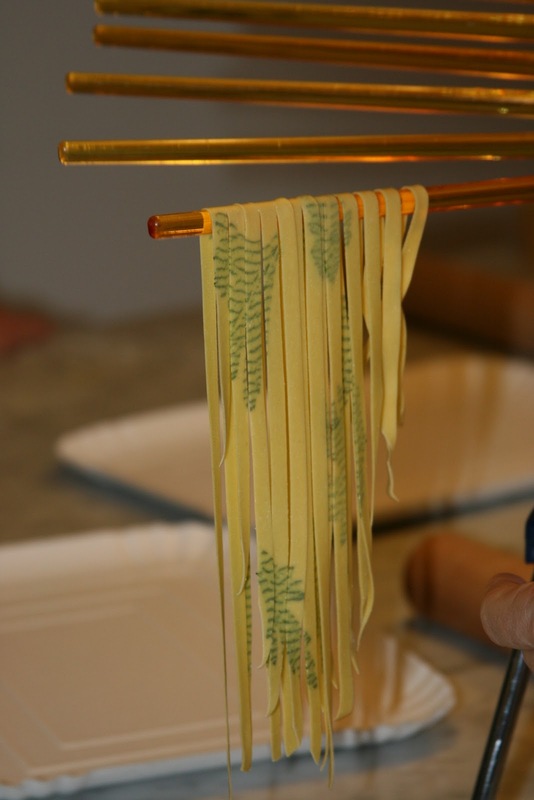 I love pasta…especially when it’s homemade. When we were in Italy, we stayed at La Petraia, an agriturismo owned by Canadian ex-pats Susan McKenna Grant and her husband, Michael Grant, and while we were there, Susan taught us how to make pasta the Italian way: put a pile of flour on the counter, make a well, drop in an egg, incorporate these two ingredients using a fork, then knead and shape the pile into a lovely silky ball of dough. From there, the possibilities of pasta creations were endless. We made fettuccine with whole leaves of herbs pressed into them. Beautiful and delicious. I’ve made pasta at home twice since then: once doing it Susan’s way, and the other using Jamie Oliver’s method from his Cook with Jamie book where he says you can use a food processor and “Just bung everything in, whiz until the flour looks like breadcrumbs, then tip your mixture on to your work surface and bring the dough into one lump, using your hands.” Bung. Whiz. Tip. I love Jamie Oliver. Jamie’s method worked surprisingly well but I bombed doing it Susan’s way. I blamed my failure on being in Alberta and not in Italy where anything you throw together (foodwise) comes out perfectly because: Food + Italy = magic. I just had a bowl of the most exquisite pappardelle at Daniel Costa’s Corso 32 and I wanted more. The Thermomix recipe from Vorwerk’s My Way of Cooking looked good (and easy!) and I was curious to see if it would result in glorious pastas like the kinds made by Daniel, Jamie and Susan. I turned to the Thermomix and got busy. Flour and eggs and olive oil go into the bowl. Hit the knead button and let it do its thing for two minutes. It’s supposed to form “large dough crumbles” whereupon you dump it out of the bowl onto your counter, form it into a ball and wrap in plastic and let it rest for 15 minutes. My dough crumbles didn’t look very promising. I knew right away something was off. The dough didn’t feel right but I let it rest and hoped for the best. After 15 minutes I unwrapped the ball, cut off a piece and went to work rolling out the dough. I opted to use a rolling pin instead of my pasta rolling machine because hauling out the pasta machine didn’t seem worth the effort. I should’ve though because the dough was tough and it wasn’t long before I was covered in flour and huffing and puffing and cursing just a little bit. Actually a lot. I was too busy rolling and cursing and I forgot to take pictures along the way until I had the ravioli formed and stuffed with a ricotta/pork belly/sage mixture. The end result didn’t look too bad and tasted alright but the pasta was tough and definitely not worth the effort in this case. Not sure where I went wrong…but in the future when I’m in the mood for pasta, I think I’ll just head over to Corso 32, sit back, savour and enjoy someone else’s efforts and the only thing I’ll have to clean up is my plate. Not a problem there, I assure you. Nice blog! You came up on my Google Alert for La Petraia! Don’t give up on the pasta. And by the way, if you are new to the Thermomix you are going to love it. It’s a real workhorse, easily doing the work of 1 cook in our kitchen. You can use it to make perfect pasta dough. 1 egg per 100 grams of all purpose Canadian flour makes enough perfect pasta dough for 2 as a starter. You can leave out the olive oil. 3 minutes on knead. For deep green pasta, try whizzing the eggs first with some spinach leaves before adding your flour. the more spinach the deeper green the pasta. You’ll need to add a bit more flour to the dough to make up for the water the spinach adds. Or add fresh beet juice. Or carrot juice. Or tomato puree. Hope you are both well and happy. Susan! How wonderful to hear from you…I hope everyone at La Petraia is well. How I miss you guys and your beautiful Eden.